A4 2510 Quicksilver build - but what colour is it? I am about to start a project of bits that is going to be 2510 Quicksilver as it left the works but before entering service. My books contain various photos and notes and say it was unique by being finished in silver with dark charcoal front and grey skirts. However I want to know what colour is 'Silver'; is it really silver? should it be 'aluminium paint', should it be mettalic silver or does it really mean 'very light grey'? Can anyone enlighten me? plus any suggestions for a manufacturers model paint? Last question, at this time did it have a corridor tender? Re: A4 2509 Quicksilver build - but what colour is it? The Precision Paint range was matched to samples collected by Derby Surface Coatings Lab which was set up by British Railways when it was formed and collected samples of all the prior railway liveries that were available. "The wedge shaped front of the smokebox casing was dark charcoal...….the aerofoil side skirting and frames were battleship grey. Above the skirting the whole of the engine, including cab roof, tender, and wheel centres, including tender wheels, were painted a pleasing shade of silver grey. lining was omitted entirely...….the name cabside numbers and tender lettering used the usual type of block letters and numbers, but in silver with blue shading." The names were painted on the boiler sides, though nameplates were used on two prior to entering service, but removed before doing so. Note that 'Quicksilver' had the parabolic version of the smokebox painting. It was fitted with corridor tender, but not the same as the A1/A3 version-there were larger fairings, later removed, and other detail differences. Note that front buffer beam numbers were not painted on until after approx. nine months. Incidentally, 'Quicksilver' is photographed-twice-numbered 2510. 2509 was 'Silver Link', and there were detail paint differences between ex works and in service for this latter engine. The original four 'silver' A4s were painted in a striking silver and grey livery. The main colour was silver grey, with charcoal grey for the smokebox front, and battleship grey for the skirts and frames. PS. Good luck with the project! Sounds very interesting. Re: A4 2510 Quicksilver build - but what colour is it? Oops I made a number error on the start of the post in calling it 2509 when its 2510, sorry about that. So precision paints it is. Ive the etches nameplates so i'm going for it ex works when they were at the front. My book says it was removed and the name written on the boiler cladding before entering service, I understand the nameplates were reinstated after 3 years when it was overhauled and refinished in Blue. Thank you all for swift replies, i'm now back on A8 building but the 2510 is surfacing ready for work. ive still to figure out how to move the Farish A3 valvegear in a bit to go under valences, (yes A3, its the same Farish chassis with the exception the front bogie has to be changed to shorther wheelbase and top sprung from the A4 body. The A8 etches came with spare brass sheet offcuts which are donating themselves for this 2510 project. At least this will be easy compared to the A8. thanks again. It will be interesting to see how the Precision Paint grey/silver will differ from the grey Dapol used for its Quicksilver. 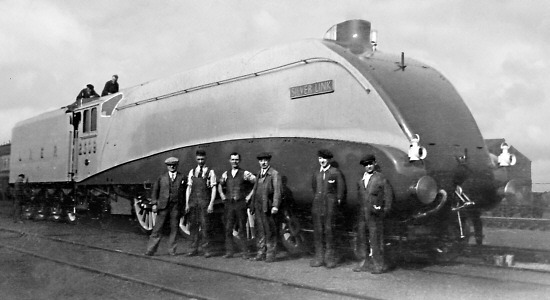 The first A4s were built with recessed front buffers for a more streamlined appearance but were soon lengthened after an accident with a shunting worker. When Bittern was painted up to masquerade as Silver Link some years ago, it was in a pearl grey shade. I've dug out my copy of 'The LNER Pacifics' by P N Townend in the 'Colour of Steam' series. It contains a colour picture, slightly faded, of Silver Link in the silver-grey livery which you might find useful. The book is still available for just over a fiver from several sources on the abebooks.co.uk website which I thoroughly recommend. I can't offer anything beyond the advice already given. However, I will put in a second recommendation for Precision Paints for obtaining the correct colour. Have you a Warhammer (ex Games Workshop) shop near to you? I have managed to find and even mix from their range of Citadel colours. You'll be surprised how close some of these shades are, and there are so many of them. Just my two penneth worth. I keep on picking my A4 Quicksilver project up and putting it down as I complete other Locos. The Loco chassis is now fully overhauled and tested, the Farish body is paintstripped, the brass for the sideskirts is to hand, i'm now to modify A3 cylinders to slightly more central to bring the combination levers inside the fairings. Fox can supply the P54 paint and transfers, however they do transfers FR2301/10 for 'works grey engines' and FRH2310/A for Silver Streamliners, as i'm doing the Loco as built before it went into service i'm asking for advice on which transfer sheet is correct? can anybody help? 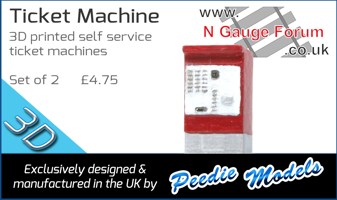 Like the photo of Silverlink here it will have the nameplates (I already have these from N gauge old stock). Page created in 0.185 seconds with 45 queries.